Stock tabled a change.org petition with over 300 signatures and comments seeking rigorous assessment of the impacts of the East West Link on the Zoo. the Zoo celebrated its 150th birthday. According the Zoos Victoria Strategic Plan it is one of the oldest zoos in the world. 1.29 million people visited, each spending an average 3-4 hours. Around 18% of these visitors were from interstate or overseas. There were 150,000 members ($93 one adult, $173 family of four). The Zoo was awarded Victoria’s top major tourist attraction (RACV awards), and Australia’s second best major tourism attraction (Qantas awards). The Zoos Victoria revenue is principally drawn from (for all three zoos) from admissions and shop purchases, last year this amounted to $45 million. One baby elephant was born, another tragically died. The Zoo is home to over 300 species (305) and more than 2,000 individual animals (2,197) and boasts 100s of staff, 100s of regular volunteers contributing time on a regular basis and financial contributors. It is also listed on the Victorian Heritage Register, recognizing its state heritage significance. 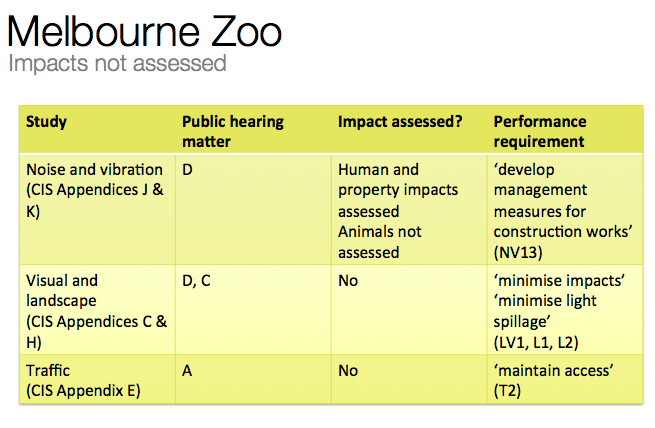 Stock said impacts on the Melbourne Zoo, a significant community facility have not been addressed by the LMA. 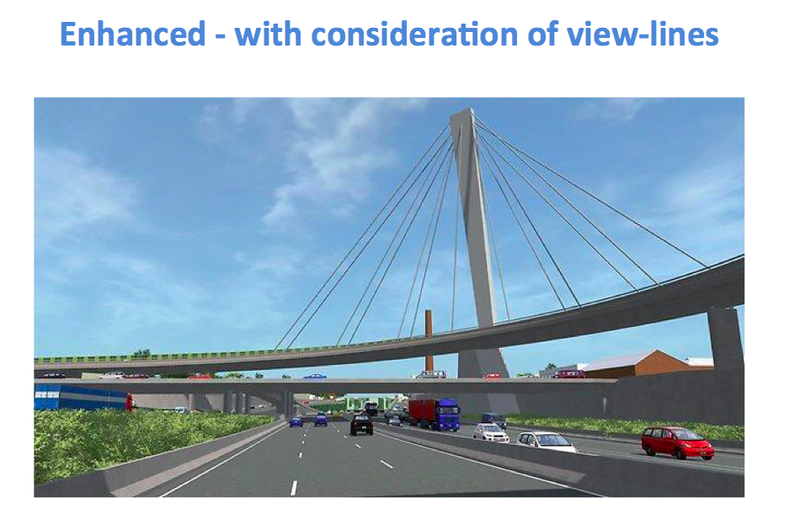 Stock highlighted the elements of the proposed East West Link on the Melbourne Zoo including offramps within 40m, a construction worksite within 20m and a 20m high, 8m diameter emissions stack likely to be visible within the zoo. She also detailed the omissions of the CIS and LMA’s responses to the Assessment Committee’s request for information in the following tables. 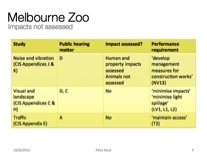 In closing, Stock says “I am simply asking that adequate assessment of the impacts of this major project on our Melbourne Zoo be undertaken, and made publicly available, prior to a decision being made about approval or contracts being signed”. LMA’s claim that the Zoo is located outside the project boundary and construction therefore is unlikely to affect its international reputation. Petit hones in on the international examples of Oregon Zoo and Yagiyama Zoos, which have been put forward by LMA and Zoos Victoria as representative projects they can learn from. Petit says: “Now let’s examine the rigour of international research conducted by LMA and the Zoo concluding that zoo animals can thrive in close proximity to traffic and exit ramps to what the LMA defines as a sensitive receptor. “The Linking Melbourne Authority’s CIS cites a tunnel under the Oregon Zoo to support its argument that there is likely to be no significant impacts on the Zoo or its animals. And there’s even a second – the Yagiyama Zoo tunnel in Sendai, Japan. But an examination reveals that these tunnels are chalk and cheese to what’s planned outside Melbourne Zoo. In fact, they are not road projects at all. “The Oregon tunnel built in the mid-1990s is a train subway passing 79 metres underground with a lift to the surface. 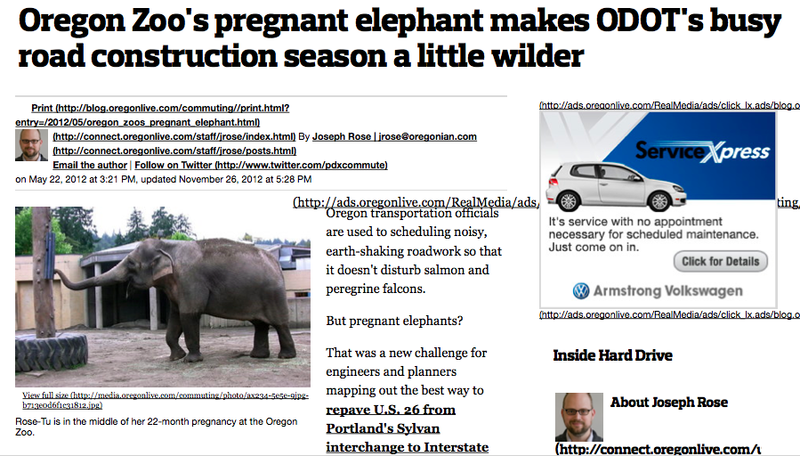 However, in 2012 the Oregon Department of Transportation did suspend works on a real highway project, a four month paving delay more than 250 metres away to avoid risk of miscarriage of one elephant at Oregon Zoo. “And that tunnel in Japan? The ironically named East-West Subway Line Office in Sendai City writes: Currently we are conducting research about what kind of impact the construction of the East-West Subway Line could cause in the surrounding environment. However, when it comes to the impact on animals, our research includes only wild ones, not the animals reared in the Yagiyama Zoo. Yet, the CIS cites the Oregon and Yagiyama zoos as representative of this project but omits details about the depth of the tunnels, the comparative infrequency of train arrivals and the closing down of highway construction for four months so one elephant had a better chance of giving birth. Petit then focuses on the health impacts of construction and traffic noise on humans and animals. He references the World Health Organisation 2011 report highlighting the lack of attention by VicRoads to nighttime noise in particular. Petit says a study of noise and vibration impacts is needed before a contract signed. He concludes “there’s an elephant in the room and the LMA just can’t see it”. Christopher Fox is a former engineer who spoke passionately about the poor process and the likely high noise levels during the construction period. He raised the stronger standards that exist in NSW and said these were recommended by the LMA noise consultant but not adopted in the CIS. He also opposed any use of cut and cover in Royal Park. Peter Campbell is a cyclist who recounted his own experiences of dealing with busy traffic and his observations over the years. He pointed out the promises made by VicRoads that traffic on Doncaster Rd would be cut when the Eastern Freeway extension opened – which didn’t happen. He said the two myths about the EWL was that it would reduce traffic in Hoddle St and that communting time from the eastern suburbs would be reduced. The queues on CityLink and the Monash freeway prove otherwise. The demolition of the Embarcadero Freeway in San Francisco to create a civic plaza was again referenced. Huda Mahadi Yesuf – Was unable to present. Mary Healy raised concerns about the number of Victorian hospitals in the vicinity of the proposed East West Link. Says a decision on the project should be delayed until proper assessment of environmental and social impacts can be undertaken, once the location of the new port is determined and the fruit and vegetables. She is concerned about the health impacts on people and animals from traffic emissions. Speaks about the central problem the proposed East West Link is hoping to solve – perceived congestion on east west routes. She details areas which will experience increased congestion. Bell raises a number of arguments against the project receiving approval with a particular focus is on disruption to public transport and the lack of detailed information or performance standards around replacement services. Failure to consider economic impacts in this process, renders the project a “partial analysis”. He talks about the principle, and importance of triple bottom line assessment and of assessing options. Susan Pepper is a birding specialist she spoke in detail about the habitats in Royal Park and highlighted the sightings of birds including the Spotted Pardalote. She said the Biodiversity study done for the CIS would “not pass as a University assignment” because of the hurried and inaccurate collection of data. Had a convincing series of slides of the Sports Precinct on the Yarra and its steady erosion from 1960 to today from open green spaces to built sports facility. The same process is happening at Royal Park with progressive erosion of the park areas which will be exacerbated with the EWL bringing “acres and acres” of bitumen. Joseph Edmonds gave a considered presentation on West Parkville and Part B highlighting the expert evidence of Craig Czarny and the legal submissions from the City of Yarra that the approval should not be given. “No engineering solution can protect our neighbourhood from these impacts”. “It is impossible to replicate the peace and quiet that a visit to Royal Park provides”. The estimate that traffic on Elliot Ave will only increase by 10% “is highly questionable and contradictory to the real reason for the interchange – to induce maximum use of the tollway” He called for the release of traffic modelling for public scrutiny. His specific concerns are that despite the billions of dollars, the net effect will be transferring congestion from one part of the city to another. He asks how will Maribyrnong Road and Brunswick Road will cope with the extra traffic. Burrows says that traffic noise already a polluting factor in Travancore. He vividly remembers the introduction of CityLink, an easy journey turned into a “nighmare of travel” with “traffic bumper to bumper”. Janet Rice, Senator elect for Victoria talks about the role of transport in adding to carbon pollution. All sectors in our society need to be transformed to reduce their carbon emissions to zero or as close to zero as quickly as possible. She says the CIS has not complied with the Transport Integration Act in that it has not shown how the East West Link was a form of transport that had the least impact on the natural environment. She says the assessment of the likely impact of the East West Link on Victoria’s greenhouse gas emissions “is profoundly inadequate”. She says transport planning needs to consider modes of travel which will reduce emissions over time. She says there is an issue with assessing greenhouse gas emissions on a project by project basis. She says “Time is ticking with regard to carbon pollution”. She asks the panel to send LMA back to do more work. Neil Barker says the CIS did not assess impacts on cycling. He talks about the Moonee Valley Racecourse redevelopment which will see increased traffic on local roads and other redevelopment including the former Readings site in Moonee Ponds. He says public transport in the area is already above passenger load benchmarks. It appears there are more reasons not to build this project rather than to build. He asks the panel to request an extension for investigating the project. Andrew Kelly [a regular community member attending the panel hearings] begins his presentation with a photo of Bill Peterson, Mayor being arrested “in the days when policemen still wore ties”. We will be uploading a full copy of Andrew Kelly’s upstanding presentation as soon as possible. Michael Thong describes the experience of owning an investment property “smack in the middle of this concrete jungle.” He has had a lot of trouble letting the flat – it was empty for months before finding a tenant, and experienced a 17% decrease in rent and only a 6 month lease. Thong would like an arrangement similar to the Evo apartments. Dr Nicholas Williams is a senior lecturer at the University of Melbourne. His original submission is signed by 12 academics from the University of Melbourne and RMIT. Dr Williams says the East West Link will see destruction of the only remaining piece of remnant vegetation in the City of Melbourne. Dr Williams says this remnant vegetation should be regarded as the critically, federally endangered grassy woodland. He is tabling publicly available information from the State Government Department of Environment and Primary Industries, which record the Royal Park West remnant as on the Victorian Volcanic Plain. Dr Williams says that incorrect and misleading information was supplied by the LMA to the Federal Department of the Environment. He says there is strong evidence that the East West Link should be declared a controlled action under the Federal Environment Protection and Biodiversity Conservation Act. Summarised the history of open space and the importance of open space. The amount of parkland in inner Melbourne is fixed yet population and demand is growing. The principle of no net loss of open space has been widely applied, including with the Royal Children’s redevelopment. 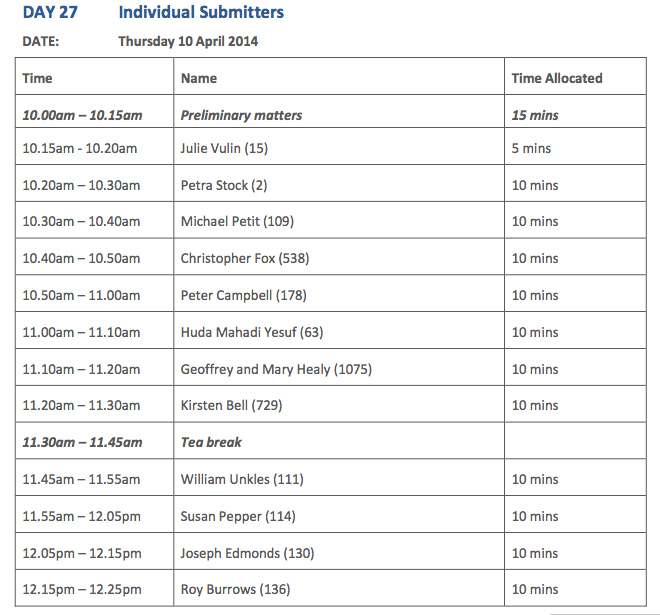 His submission details the benefits of open space recognised in Plan Melbourne and by Parks Victoria in Health Parks, Healthy People.He is providing a list of references from Medicare study and Beyond Blue research. Cited Eddington report recommendation that there be no interchange. Recently employed by Transport for London as a planner and forecasting. Focus on managing congestion and ensuring roads serve all users – not just cars. Spoke about the weakness of relying on agglomeration benefits which are normally associated with rail rather than road projects. There was insufficient data in the CIS to make any assessment of the claims. A historian and local resident. Focussed on the off ramp to Arden St. This is not a benefit to getting people from east to west but will increase pollution and impact on Bent St. Yet the adjacent bridges have low clearance 3.1, 3.4 and 3.7 metres and unsuitable for trucks. This forces traffic up Macauley Rd and thus can’t access Dynon Rd. Tablems maps and photos. Amina works in school community change and education. She spoke about the poor process and the insensitive disregard for community and liveability – emphasising connectedness. Bernard spoke on congestion and traffic habits using effectively two different maps of Royal Park previously used by witnesses. One shows the park as a unified area of green with many activities. The LMA version shows it sliced into a dozen separate segements isolated from each other. He called for the establishment of an independent planning authority to achieve better design and outcomes for Melbourne. Focussed on three issues which have not been adequately considered in the CIS. The Reference design includes an underground merger from four lanes to three. He highlighted the dangers of this and the absence of a pedestrian emergency exit as exists for the Burnley Tunnel. These systems worked in March 2007 when the Burnley tunnel disaster happened but they are lacking in the reference design. He also went back over the evidence on water quality highlighting the lax criteria being proposed and the need to improve the water quality in creek – not just require it doesn’t get worse. The Residents Against the Tunnel (RATs) include a core group of 15 people and another 170 signed up as supporters. Building on their comprehensive submission, the RATs focused their presentation on six areas of impact – air quality, health, visual, the construction phase, existing buildings and compensation. David Hanna, Collingwood spoke first. He said RATs represent a large cross-section of the community including people whose houses are being acquired, those left behind, locals left to breathe in the emissions and experience increased noise. Air quality – Ruth Clemens, Richmond spoke on air pollution and health impacts. She said a 2013 AMA Submission to the Inquiry into the Impacts on Health of Air Quality in Australia estimated the health costs across Australia associated with vehicle emissions to be between $600 million and $1.5 billion per annum. She said locals will bear the short and long term health impacts of increased emissions from the proposed East West Link. Clemens said Yarra has above average respiratory and related illnesses. Clemens said two years of background monitoring was undertaken for Easatlink and asks why air quality data was not collected for this project. She said the CItyLink monitoring station was closed down in 2003 despite the developers earlier being fined by the EPA for scientifically fraudulent air pollution figures. Cheryl Apperley, Clifton Hill spoke on noise, light and mental health issues. She said the CIS is able to hide behind lack of regulation – there are no standards governing acceptable levels of traffic noise in Victoria. 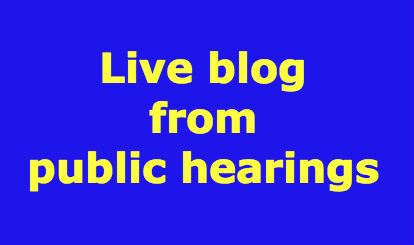 She also said “there is no regulation or standard relating to road light minimisation or natural light maximisation for residences located on and around road developments; despite mounting evidence of the negative health impacts of light trespass. There are however a plethora of standards in relation to the minimum acceptable levels of lighting to ensure a safe journey for the motorists”. Apperley talks about the impacts of light spill into bedrooms, and also overshadowing due to noise barriers. Apperley also talked about the stresses for ordinary people contending with this project due to the large number of unknowns. James Milne, Parkville spoke about the construction phase of the proposed East West Link. He spoke about the impact of construction on residents over (a minimum) of five years, “and that period hasn’t even started – although both families are already living with stree, sleepless nights and uncertainty.” He provides detailed examples of the impacts of construction at both ends of the project in Parkville and in Collingwood. Ande Bunbury, Clifton Hill who lives next door to the Provans Hardware Store is a Registered Architect. Bunbury said “No consideration is given in the CIS to what we consider to be the very real potential for structural damage to homes & businesses in the surrounding areas as a result of the disturbances that the project would cause. 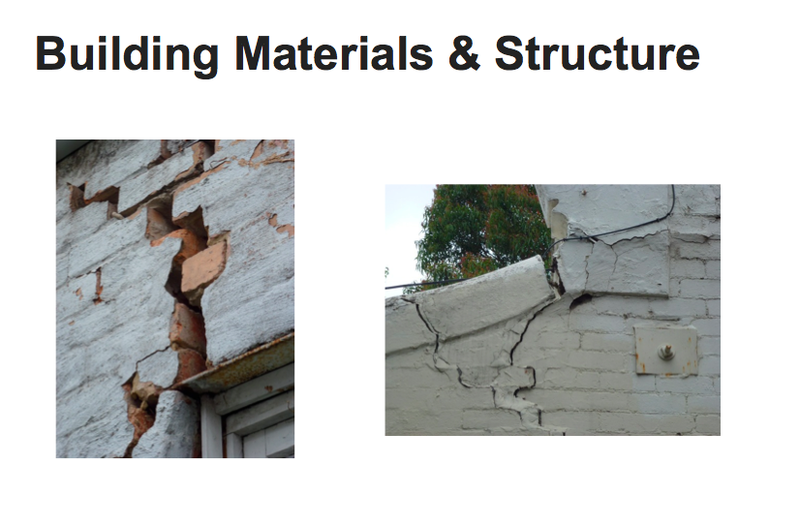 Furthermore, there are no assurances given that if buildings suffer structural damage as a result of construction, there will be restitution or compensation for the financial loss and emotional stress suffered. Bunbury talks about the risks of vibration and blasting due to the heritage buildings, predominantly in brick with underlying complex geology and some area prone to ground movement. Harriet Mantell, Collingwood discussed the inadequacy of the proposed approach to compensation: the inadequacy of the existing compulsory acquisition provisions, the proposed timing of compulsory acquisitions and the arbitrariness of voluntary acquisitions.